This rare manuscript by U. F. Grant, originally sold as The Devil's Scrapbook , contains a lot of interesting material. Hidden in its pages are some little gems that you will not find anywhere else. There are no long descriptions of the methods, as Grant himself explains. He goes directly to the point. 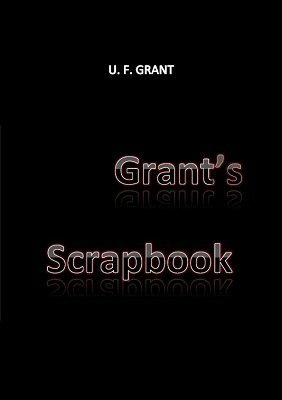 The style is typical of Grant and we made only some minor corrections of typos. This is a collection of picked items taken from an exclusive scrapbook....items that would have normally been sold separately at One...Two....Three Dollars A Piece. We are not going to give them a big build up in the explanations, but give you the exact method of working them, and let you see from actual performance of these various effects that we have honestly given you a wealth of workable, effective stunts.....There are and still is coming out scores of beautifully printed books with much good material in...BUT...in most cases the good material in these books come from manuscripts of this type and the buyers of books get this material a few years after you the manuscript buyers have had the use of it..."
Performer displays two decks of cards in their cases. One is placed on table in full view, other is removed from case and a person told to place it behind their back and cut deck anyplace then to remove top three cards from deck after the cut. You pick up second deck place it behind your back and remove three cards...and these three cards match the three the spectator freely selected and has behind his back! Shuffle deck then spread backs up. Have a person toss a penny on any card, then they select which three cards they wish to take, the three to left or right of penny. They keep one card and pass the other two to their neighbors. Each one looks at his card and they are returned to deck. Again deck is given a shuffle. Then wrapped in a piece of newspaper. Anyone holds wrapped deck, a second person plunges knife blade into deck anyplace. Then you tear paper away and part deck at blade section end show card above blade and card below blade are two of the selected cards and then pretend that trick is over. Soon the third person will say. "'What about my card". So you plunge your hand into pocket and pull out proper third card for a perfect climax. Mysterious flashes of light come from your eyes during the show on stage. Vanish the content of a full saltshaker in bare hands. Change a message on a piece of paper signed by spectator. Hey! Where is my pen ? 1st digital edition 2013, 13 pages.